How can you prepare for lung cancer surgery? If you and your healthcare team decide on surgery as a treatment for your lung cancer, preparing ahead can ease some of the anxiety, and may help improve your outcome as well. To make sure your surgery is as successful as possible, what should you expect and what questions should you ask? What Tests/Visits Will I Have? Before having surgery, your physician will want to make sure you are as healthy as possible. Depending on the type of surgery you will be having and your general medical condition, your doctor may recommend tests in addition to those listed. Medical history – Your physician will first want to review your complete medical history. If you have had surgery in the past, it is important to share any complications you had, such as breathing problems or blood clots following surgery. He or she will also ask about the medical condition of your family members, including any problems anyone has had with anesthesia. A second opinion – Do not be afraid to ask how many cases of lung cancer like yours that your surgeon has operated on – and compare. Just as carpenters or plumbers vary with their experience doing different procedures, so do physicians. Learn why it is so important to get a second opinion with lung cancer. Donating blood – If there is enough time, some people choose to donate their own blood before surgery in case they should need a transfusion. 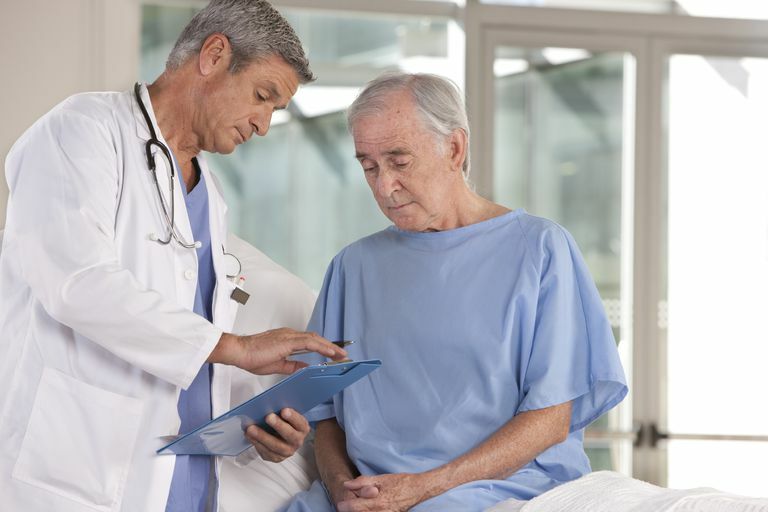 Advance directives – Most of the time lung cancer surgery goes smoothly, and you will be able to make your own decisions for care when you awaken. Occasionally, complications arise and you will need others to make those decisions for you. Starting the night before surgery, you will be advised not to eat or drink anything until after your surgery. Ask your doctor about any medications you usually take in the morning, and if you should take them the morning of surgery. You should avoid wearing any make-up, nail polish, contact lenses, or dentures. Your surgeon, as well as your anesthesiologist, will talk to you prior to surgery and have you sign a consent form. The surgical staff will let your family know where they can wait so they can be updated on how your surgery is going and when it is finished. Make sure to bring your insurance information to the hospital, but it is best to leave valuables at home or with a family member. What Can I Do to Make Surgery Most Successful? Preparing ahead of time not only maximizes your opportunity for a successful procedure but also can fill some of those agonizing moments as you wait. If you smoke, quit – Quitting smoking for any period of time before surgery, can make a difference in your ability to heal afterward. Talk with your healthcare team about exercise after surgery. Even moderate amounts of exercise after surgery can speed your recovery. Lay out a plan ahead of time for getting help when you return home. Who can help you with chores? Who can be available if you are afraid of being alone? Can someone arrange to have friends bring a meal each night? Talk to your doctor about pulmonary rehabilitation and breathing exercises. Research suggests that those people who do breathing exercises before or after surgery have better lung function and a better quality of life following surgery than those who don't do these exercises. What type of lung cancer surgery will I have? Why is this type being done instead of another? What complications might I expect, and what signs should I watch for? What activities will I be able to do upon returning home? Will I need help around the home? If I am not able to manage myself at home, what options are available for transitional care? Who should I call if I experience any problems after returning home? What medications will I be given to control my pain in the hospital, and upon returning home? What is my chance of recurrence after surgery? Is there any way to lower my chance of having a recurrence? How often will I be monitored after surgery? What can I expect over the long run - such as a year or five years after the surgery? When it comes to having surgery, we often hear stories about others that have gone through a similar situation. With lung cancer surgery, support from others that have experienced the same thing can be a great comfort. But keep in mind that there are several different types of procedures and your own experience may be very different, depending upon the type of lung cancer surgery you have, the stage of your lung cancer, and your general health. Colice, G. et al. Physiologic evaluation of the patient with lung cancer being considered for resectional surgery: ACCP evidenced-based clinical practice guidelines (2nd edition). Chest. 2007. 132(3 Suppl):161S-77S. Liu, W. et al. Breathing exercises improve post-operative pulmonary function and quality of life in patients with lung cancer: A meta-analysis. Experimental and Therapeutic Medicine. 2012. 5(4):1194-1200.